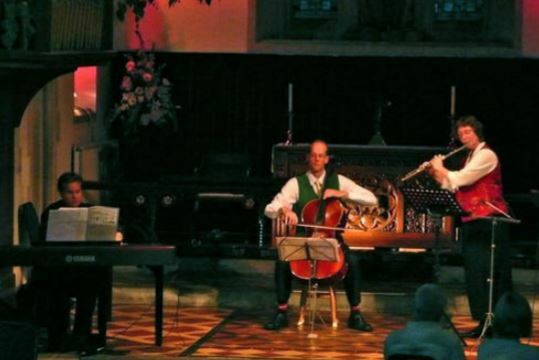 Speranza join us for their debut lunchtime recital at the New Room. Natalya Brazhnikova is a piano accompanist and teacher of chamber music in Gnesin Academy of Music in Moscow. Peter Gilks is a rector in Andover. Before ordination he trained as a musician at Nottingham University, specialising in organ and piano. In the intervening years he has gained quite a lot of keyboard experience mainly as an accompanist, performing with choral societies and individuals in a variety of venues from pubs to cathedrals. Julian started playing the piano at the age of 6 and the clarinet at the age of 10. He served in both the Somerset and the National Youth Orchestras as clarinettist. Julian studied music at Clare College, Cambridge, where he developed his gift of composition. Julian is rector at Nursling and Rownhams Churches. He is an avid cyclist and Francophile and has recently returned from a strenuous tour of the Massif Central. Cathy graduated from the Royal Northern College of Music in her native Manchester. She was a member of the Bournemouth Sinfonietta, a 1st violin in the Royal Liverpool Philharmonic Orchestra, a member of the Welsh National Opera Orchestra and then a member of the BBC Radio Orchestra and the BBC Concert Orchestra. She has also freelanced extensively in and around London. In her spare time, Cathy enjoys playing chamber music, is a leader in her local church and going for walks in the Meon Valley. She has also recently discovered the delights of cruising!